When is the last time you took a good look at what your customers’ entire experience is like when they deal with your company? If your answer is: Never or not in the last couple of years, you may want to read on. What is a customer experience journey? A customer experience journey (aka customer experience map) is the detailed (or sometimes not so detailed) analysis of the experience a specific customer segment has when interacting with your organisation for its entire life cycle, either through one of your employees or any media content you issue. If you really want to dig down, mapping your customers’ interactions with third parties representing your brand (suppliers, distributors, etc.) can also be examined. This information is then presented either graphically or via tables. If a customer experience journey needs to be communicated quickly to a large group of people, a video is sometimes produced to get the information across. 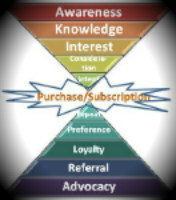 The customers’ experience is mapped from the top of the sales funnel all the way down to the last segment of the retention and propagation pyramid. Additionally, specific actions such as purchase, usage and customer loss will be broken down to reflect any potential customer touch points. Organisations usually task marketing management to accomplish the mapping. Idealy, it should however be done by a team of the top managers of every department that has customer touch points. If this is your first time at doing a customer experience journey, you can start with the areas where you think there are issues. These will generally yield the highest returns for your organisation. Once you get the hang of it, you can add customer touch points to your journey progressively until you cover the entire spectrum of your customers’ experience with your organisation. Returns! Yes, I did write returns. If you have read this blog for a while, you know I would not recommend any costly marketing action unless it has the potential to be profitable for your organisation. Your first endeavors into mapping your customers journey will generally yield the highest results. Those results can have a dramatic effect on your bottom line. Managers and owners are usually aware of certain ‘’glitches’’ in the experience they offer their customers. Seldom are they prepared for the results a first mapping produces. Their initial reaction is often one of shame and/or impressions that their organisation is bleeding money unnecessarily. Their second reaction is to start acting to resolve the issues brought to light by the mapping exercise. Each of these benefits brings sub-benefits which also yield financial returns. A large proportion of these returns usually go straight to the bottom line. It makes sense given that improving your customers’ experience is equivalent to making your organisation more efficient at fulfilling its mission, which boils down to satisfying your customers’ needs. If you are looking for lasting ways to increase your profits at a higher rate than your costs, mapping your customers’ journey through your organisation may be your answer.